For more of the bracing interview below, and to learn how Connor’s Granny told the fortune of one of the three men, click above. The reunion report excerpt appears courtesy of the Harvard Alumni Association. With this talk of thrills we are not of course referring to the 2015 Red Sox. 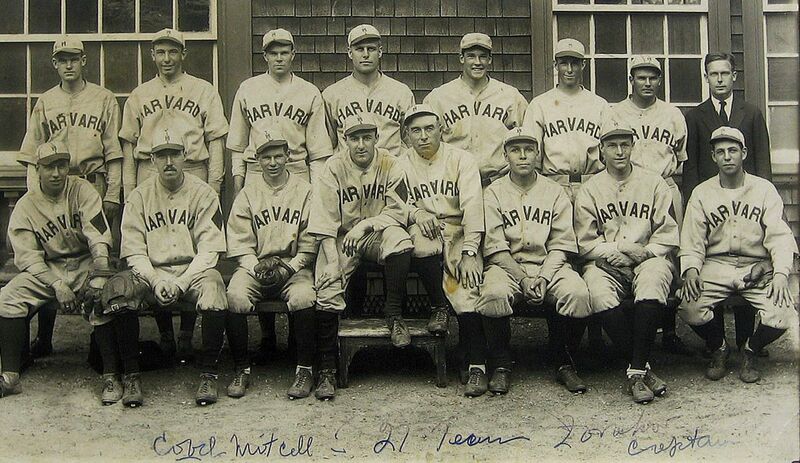 We are harking back to the happier days of the 1927 Crimson baseball team— “one of the best of all time,” according to The Second H Book of Harvard Athletics. Isadore Zarakov ’27 was the captain, Fred Mitchell the coach. Izzy Zarakov never got his degree (he failed his general examinations), but before he didn’t, he left his mark on the Harvard record books. He played football, hockey, and baseball, lettered eight times, and in 1968 was inducted into the Harvard Varsity Club Hall of Fame. Interrogation: James N. Connor ’60, a musician who lives in Boaz, Alabama, writes in his fifty-fifth anniversary class report: “After football season of my junior year at Gadsden (Alabama) High School, my homeroom was visited by three men in neat Sunday suits with rep ties and perfectly ironed sparkling white collars that had absolutely none of those microscopic wrinkles ironed into them like my white cotton collars always had when Mother made me iron my own Sunday shirts. And, yes, each pair of shoes were shined so bright that I thought I could comb my flattop in their reflection. They asked Mrs. McWilliams for permission to take me to the principal’s office. I knew then that these three guys were special police investigators who had come to take me to juvenile hall because, when I was thirteen, I had stolen a roll of tools from Sears and Roebuck Co., which I’d been using to keep my Cushman Motor Scooter running so I could deliver my morning paper route.